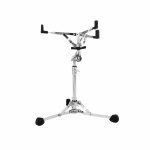 This Yamaha stand has been a favorite of players who are looking for a medium weight, easy adjusting, single braced snare stand. It can hold up to heavy hitting and is easy to transport. The SS-740A has been a reliable stand for busy New York players for years. Priced right!! A Heavy Weight stand designed for the heavy hitter. The SS-850 is a no-thrills all around dependable stand. Legs are double braced with great stability and large rubber feet. This is typical of the well developed Yamaha hardware. 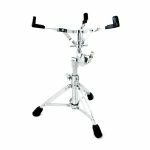 The Yamaha Lightweight Snare Stand SS-662 is a compact, single-braced snare stand designed for 10-inch to 12-inch snare drums. It is light and easy to adjust. A perfect stand for piccolo size drums. A very sturdy and adjustable stand, the S500 meets the demands called for in a general use snare stand. Its a simple, dependable slip-proof stand that holds up to travel and light enough not to weigh you down. 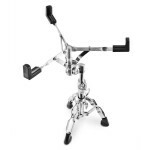 The off-set snare tilter is ideal for any angle and easy to adjust. Double brace legs assure stability. Priced right! The Pearl S-1030 Snare Stand is able to accommodate drums from 10"- 16" in diameter. It is heavy duty and features Double-Braced Legs, the Gyro-Lock tilter system, Air Suspension Rubber Tips and the Trident Design Tripod. This is one of the most versatile stands on the market! 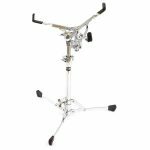 The Pearl S-1030LS Concert Snare Stand features Single-Braced legs, the Gyro-Lock tilter system, Air Suspension Rubber Tips and the Trident Design Tripod. The basket fits drums from 10" to 16". The stand extends approximately from 25" to 32" in height. Pearl’s Concert Snare stands have been a favorite of orchestras for a number of years. 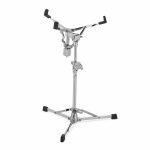 The Drum Workshop DWCP7300 Snare Drum Stand is designed with single-braced legs making it a lightweight stand. It is preferred by many jazz players due to the ease of adjustment and compactness. It can endure touring and remains a very stable stand. The new S-830 replaces the 790 series stand. It has a more advanced Uni-Lock Snare Tilter as well as new collars. It is double braced and very stable. The 830 series is the lightest weight stands Pearl makes. 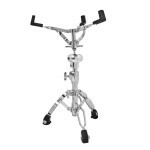 This is an extremely well-priced snare drum stand. 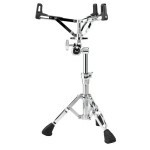 A unique product, the Yamaha Heavyweight Snare Stand SS-950 is a double-braced stand for those looking for endless adjustment. The "Ball and Socket" design of the tilter gives unlimited options and the spiked feet prevent movement as you are "laying it down". This is a Heavy Duty stand!! 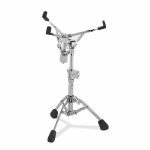 The Drum Workshop DWCP9300 Snare Drum Stand features a Heavy-Duty offset removable basket. It has infinite adjustment and memory lock included. The legs are double braced with great stability. This is a stand made for touring and heavy hitters. It is a well constructed, developed snare stand. The large adjusting nut on the tilter makes for easy setup. 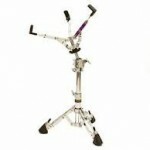 This Heavy Duty Drum Workshop DWCP5300 Snare Drum Stand has a fine tooth tilter and double braced legs. The DWCP5300 is a strong, durable stand with easy adjusting ability. It's made for touring and studio work requiring a stand for heavy hitting. It has been a leading choice of pros for years. 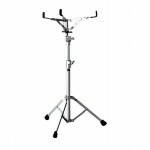 The Drum Workshop DWCP6300 Snare Drum Stand has a flat base, is easily adjusted and easily folded for transport. 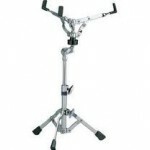 It is made for lighter style playing and developed to hold the snare firmly. The 6000 series hardware was designed with compactness and lightness in weight as a major priority. 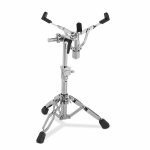 The Pearl S700L Concert Snare Stand is a single braced stand with gear titlter system which is lighter weight and yet excellent for traveling and school or educational uses. This stand's height adjustment of 23.62" to 33.46" accommodates sitting as well as standing playing positions. Pearl's Concert Snare stands have been a favorite of orchestras for a number of years. 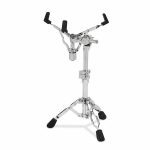 The Pearl S-1030L Concert Snare Stand features Double-Braced Legs, the Gyro-Lock tilter system, Air Suspension Rubber Tips and the Trident Design Tripod. The basket fits drums from 10" to 16". The stand extends approximately from 25" to 32" in height. Pearl’s Concert Snare stands have been a favorite of orchestras for a number of years. 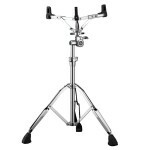 A combination of steel and aluminum makes the Canopus CSS-4HY Hybrid Snare Stand light in weight, yet very sturdy. The gearless tilter system will accommodate any angle desired for playing. The wing nut has been redesigned for easy and quick adjustment. Weight is 7.51 lbs. and the height extends from 17.32" to 22.44". 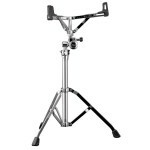 Canopus has designed a Light Weight Snare stand weighing only 3.08lbs. The joints are covered with nylon bushes for additional strength. The flat base gives stability and the stand folds compactly for easy transport. The Pearl S105S Snare Stand features a gearless tilter and is easy to adjust to your favorite angle. Extremely lightweight, the stand weighs 5.18 lbs. Perfect for gigging and reducing weight in your trap case. The flat base can be converted to a single-braced tripod stand by flipping the convertible tripod base. FREE SHIPPING WITHIN CONTINENTAL USA! The Mapex Falcon Snare Stand is state of the art for the pro. 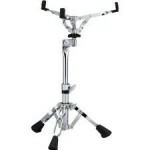 The basket is centered over the stand base to improve the balance of heavier drums and to make foot positioning easier. The center tube has been designed to drop down to the lowest level to provide for added height of deeper snares. The Rubber Feet have retractable spikes to preventing sliding. You've got to check this stand out! The all new design of the S-930 Snare Stand includes new collars and a new designed Trident Design Tripod. 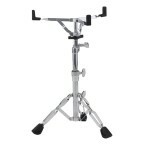 The stand fits drums 10" to 14". It features air-suspension tips and a UniLock tilter.. 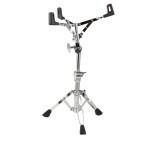 This is a very well-priced stand from Pearl for the all around drummer.